Few weeks ago I got an email from a young fan of Bauhaus, he requested me to send him a recording of an old gig. He stated that he has nothing to send in return but I didn’t mind as I like to do favours. I sent it to him and got a heartfelt ‘thank you’ email but there was something in it that really shocked me. 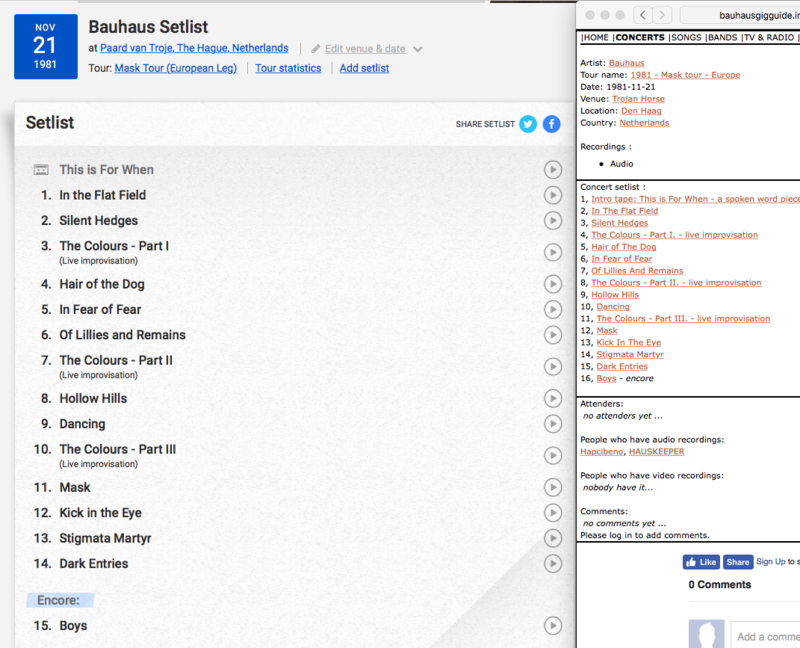 He said it must have been huge work to copy all those Bauhaus setlists from setlist.fm onto my website. I said “What???!! 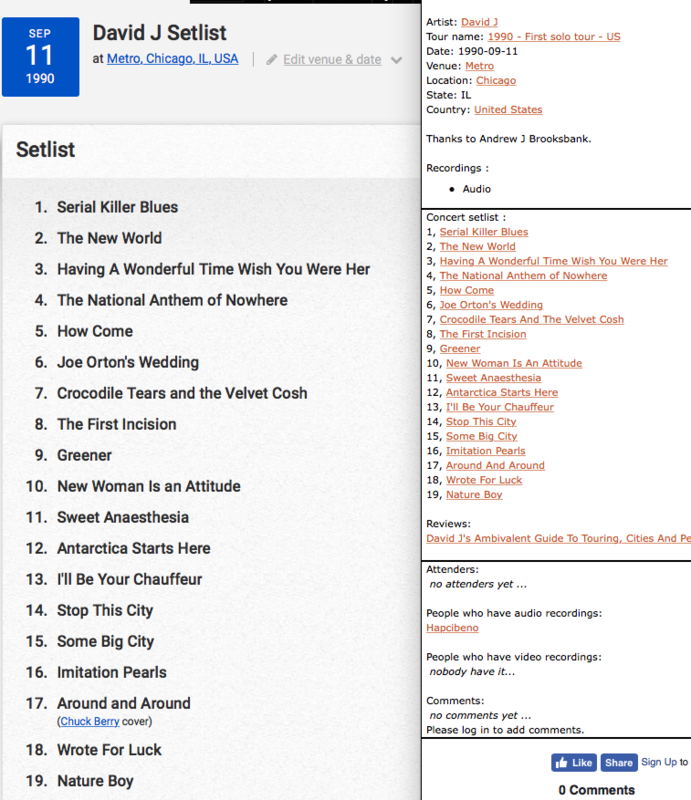 !” and went to setlist.fm to see that most of setlists from my website now appear there. ALMOST EVERY setlist that I collected and worked out from old bootleg recordings and stuff I got from other fans have been added to that website by Trentkers and Blue_Meany (and maybe some more users ) without asking me, giving credits or at least adding a simple link to my website. I wouldn’t mind if it would be a couple of setlists but I speak about few hundreds. I know it’s very hard to prove it, but i’m pretty sure about it. Just take a look at the following examples. I believe there is no such thing as copyright for this material but people should respect other people’s work. 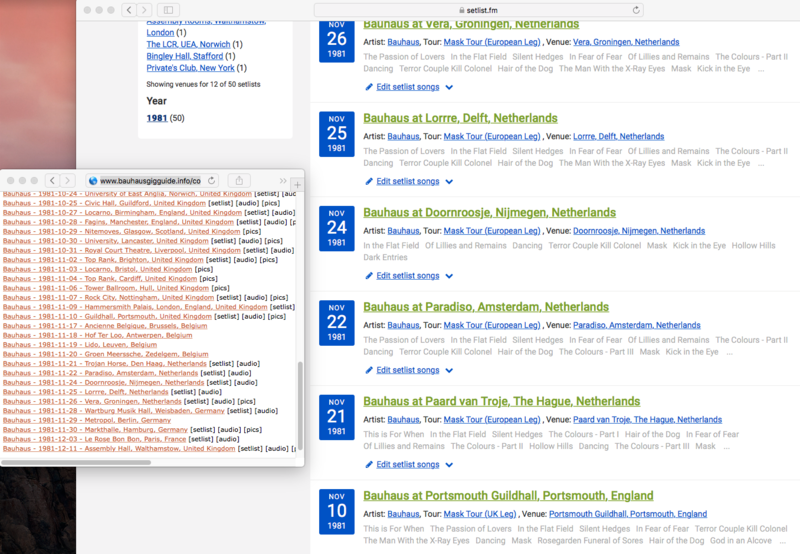 I have worked out most of the setlists myself, listened over 500+ hours of music, compared different versions of songs etc, and maintained my website for almost 10 years. And now somebody just came and suggested that I have lifted material from setlistt.fm, and that really pissed me off, that people think I’m a thief even though I have put serious work onto my website…I think that using (or ‘stealing’ if I want to be frank) that huge amount of work without any permission is such an awful thing that I had to say something about it. That’s something that I really don’t like about Internet. People think that just because things are up there they could be used without permission. I have seen lots of material from my website floating on various websites and social media and mostly without linking source or giving credits. I believe that you came across with that great photos of Bauhaus with Nico @ Manchester 1981? That photos were made by Akiforhair and been published on my website first with credits and thanks to the author who was kind enough to digitise them for me. And then somebody just shared that pictures without credits and you know the rest. They were used everywhere, sometimes even with wrong date/venue (Salford Uni) but always without mentioning the photographer. That’s how this world works now. 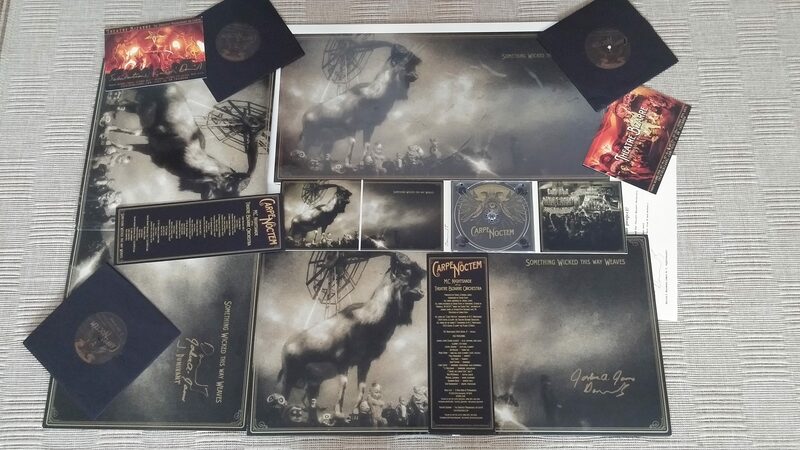 Carpe Noctem is available on CD now! This is the latest addition to my Bauhaus / related live rarities CD set, the 4th disc of David J solo and 9th disc of the set. Unreleased original songs and cover versions are marked with blue, released songs are marked with red, just like on the other 8 discs. Track 14 – Studio version is available on An Eclipse of Ships (2014) as hidden track. Track 17 – Demo version is available on ‘Nation Of Saints – 50 Years Of Northampton Music’ CD. Demo and studio versions are available via David J’s Patreon site.